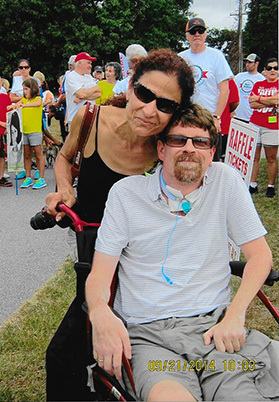 The ALS Association Rhode Island Chapter has utilized the funds generated by the Ice Bucket Challenge to expand and enhance its level of support for several important Care Service initiatives. For instance, the chapter has added additional staffing to increase the rate and frequency of clinics being offered at the chapter-sponsored “Louise Wilcox Multidisciplinary ALS Clinic.” This has increased the number of clinics from approximately one meeting every three to four weeks, to one every two or three weeks. This new schedule has helped eliminate the growing back log of repeat patients waiting for their next appointment, as well as the waiting list of new patients who want to participate in the clinic. The chapter also allocated $500 in Respite Care Funds per family to provide additional in-home services to ALS families that have exhausted their annual Respite Fund allocation. The chapter increased its total annual Respite Fund allocation by 25 percent per ALS family, from $2000 to $2,500. Additionally, the chapter expanded its Home Access Program that offers grants to help individuals pay for items like handicapped ramps and stair lifts. These reimbursement grants were increased by 50 percent, from $1,000 to $1,500 per household. Finally, to help meet the requests of ALS patients and caregivers, the chapter purchased new items for its Equipment Loan Program. These new medical equipment purchases included a Hoyer Lift, several Recliner/Lift Chairs and five new Transport Wheelchairs. Christopher D. Leidigh and his wife, Mary Tsangarakis, have benefited from the chapter's newly expanded Equipment Loan and Respite Programs.